There’s something satisfying about chucking a few ingredients into a big pan, heating it all up slowly for a few hours, and emerging with a sublime casserole or stew with the absolute minimum of effort, and this particular tagine is a fine example of that form of (dare I say) lazy, one-pot, slow-cooking. The key thing that stands out about this method is the literal simplicity of it. When I wrote a few lines ago about ‘chucking a few ingredients into a big pan’, that’s exactly what happens. The whole lot goes in right at the start, to be gently fried for a while, covered with water and allowed to slow cook for a couple of hours. It really could not be any simpler. 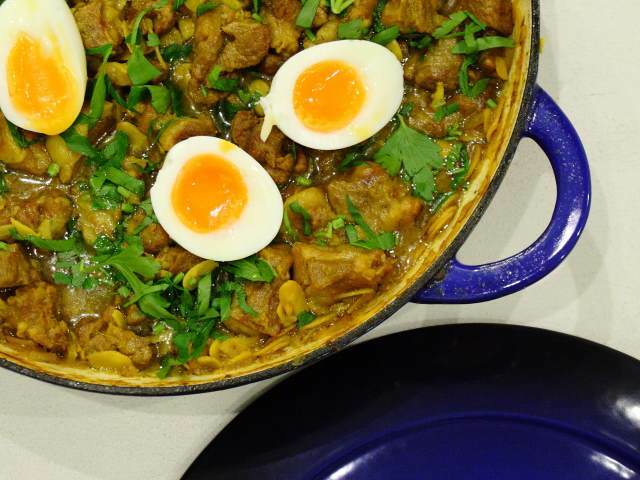 The result is excellent – a mild tagine of lamb that disintegrates at the slightest touch, wrapped in a rich, brightly coloured sauce and set-off by the crunch of almonds. So, select a big, shallow pan with a lid and add 1.5kg of lamb shoulder, leg or chops, cut into big chunks a couple of inches square … it’s best to use pieces of a substantial size for this dish. I used lamb shoulder, which came on the bone, so I butchered it down into suitable pieces and added the remaining bones to the pot too, fishing them out before serving. Bones add flavour … it’s as simple as that, and it’s a great idea to add them to something like this, even if you don’t want them there on the table. Next, to flavour the meat. There’s nothing fancy here, just a teaspoon and a half of salt, half a teaspoon of black pepper, two finely chopped onions, 50g of ghee or butter, a generous teaspoon of turmeric, half a teaspoon of crushed coriander seeds and 110g of almonds. If you have it, half a teaspoon of saffron, steeped in a few tablespoons of water will make the colours sing. Stir and fry the meat and spices over a medium heat for ten minutes or so, and then cover the meat with water, and cover the pan with a lid. After an hour, perhaps longer, maybe even two if you decide to use mutton or goat (which would be a very fine idea indeed), the tagine should be just about ready. Remove the lid, turn up the heat and allow the sauce to reduce and thicken until it meets your approval. Garnish with parsley or coriander, and some eggs, soft-boiled and halved. The pan is the key to this dish – this is a fairly shallow cast iron one from Denby that’s perfect for this type of slow cooking. It’s got the heft and feel of something that’s easily going to outlast me in terms of ‘practical usefulness’. by Arto Der Haroutunian, which is a treasure trove of tagines and other dishes from across the southern Mediterranean.